Google Play will automatically select which version (ARM(32bit), ARM(64bit) or x86) of Kodi you need, and will also automatically handle updates (unless you change your Google Play preferences). Note: Be sure to backup before you install this! These alpha and beta builds are considered "semi stable", and contain the latest changes to Kodi. They may contain bugs and/or drastically change how the program works. Please report any bugs and issues you come across to the Kodi forum. 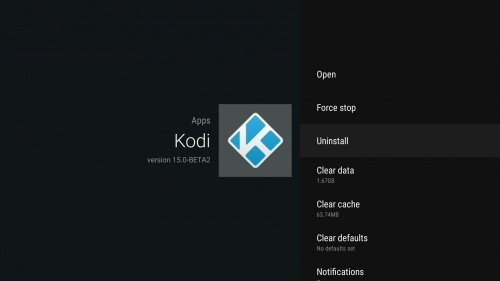 If you want to go back to the most recent stable version, uninstall the Kodi nightly first and reinstall Kodi either via Google Play or the manual installation which is explained in this article. 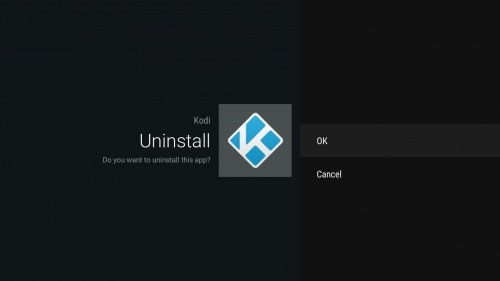 Uninstalling the Kodi nightly and reinstalling Kodi will reset all Kodi settings. So make sure to backup your stable Kodi settings before testing nightlies and then restore from that backup once you have stable Kodi installed again. This includes installation instructions for phones, tablets and most boxes running Android. 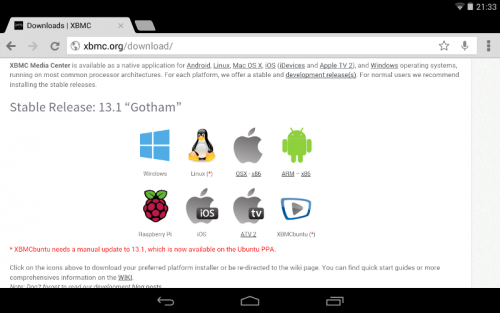 Here's how to install Kodi from an .APK file. This is commonly known as "sideloading". 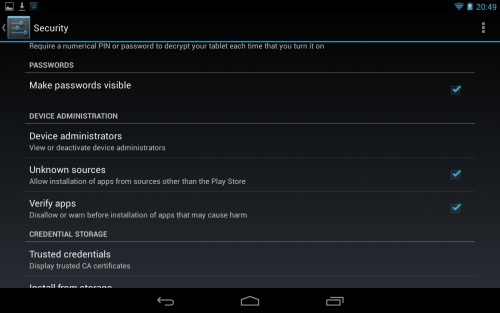 Step 1: First located the settings menu on your Android device and search for the "security" menu. Step 2: Now enable "Unknown sources" option. 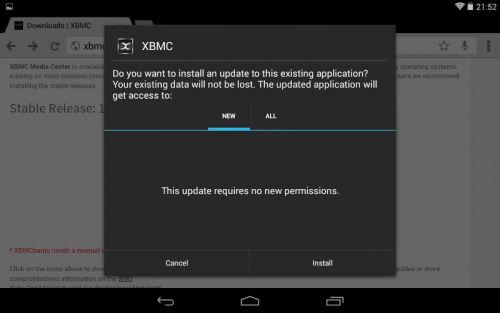 This will allow you to directly install Kodi as easy as you would install it from Play Store. 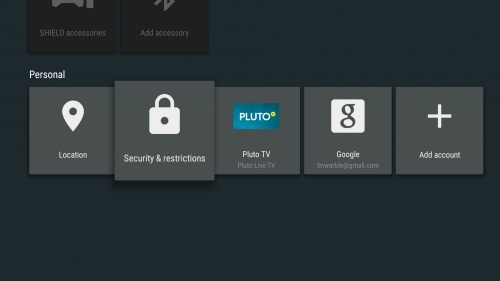 Step 1: From the Android TV launcher, scroll down to and select "Settings". 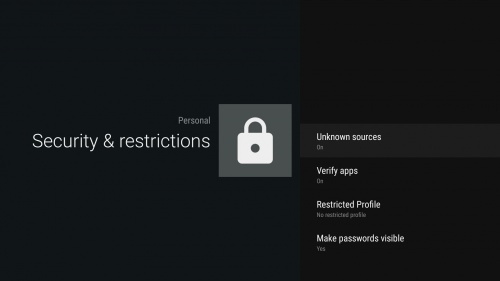 Step 2: From the "Settings" menu, scroll down and select the "Security & Restrictions" menu. Step 3: In the "Security & Restrictions" menu, turn on "Unknown Sources". Download Kodi for Android from the Kodi.tv servers. Official stable builds can be found here: http://kodi.tv/download/ You need to either select the ARM or x86 version depending on your hardware. From a desktop computer or phone/tablet, go to http://play.google.com using the same Google account as used in your Android TV device. Install a browser such as Chrome. Select your Android TV box from the popup menu after clicking the install/get button. To make things easy, connect a USB or Bluetooth mouse. Open the browser either by voice remote (for example, say "Open Chrome") or from something such as Sideload Launcher. Follow the rest of the steps below for "'Normal' Android"
Step 1: Load up http://kodi.tv/download/ in your Android web browser. Most users will want to use the ARM link, unless you have an Intel or AMD CPU. You may get a warning trying to download the file depending on which browser you use. You should say "OK" to actually download it. 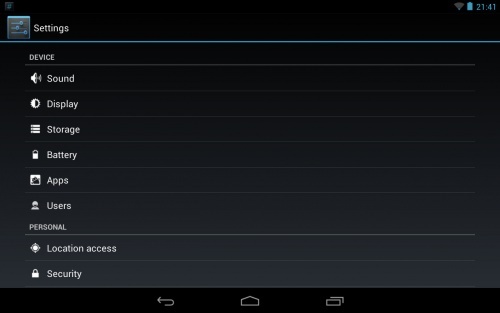 Step 2: Wait for the "apk" to download. Installing the Kodi app package is as simple as just finding the .apk you just downloaded and opening it up. You can do this either though the download menu in the web browser or selecting it with a file explorer. Step 1: After selecting the Kodi apk file you might be asked to select something to open it with. 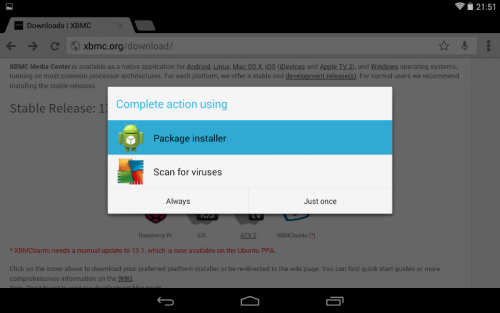 "Package installer", "Google Play", or some similar option will be what you want. 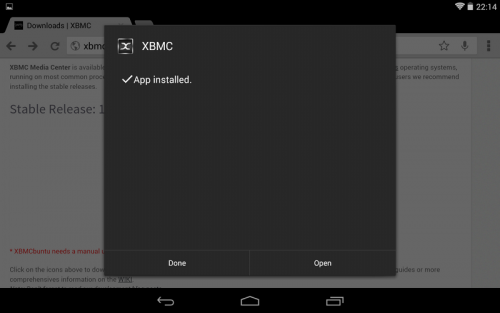 Step 2: You will get another confirmation screen where you will need to select "install". Step 3: Wait for the installation to complete. 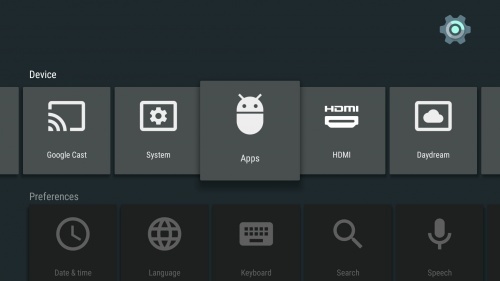 Step 4: You've now installed Kodi for Android! First run: The first time you run Kodi it will take slightly longer than normal in order to finish some final installation steps. When it is done Kodi will open normally. This is only done once per installation/update, so the next time Kodi will start up a little faster. All done! : Once started you are on Kodi home menu just like on any other platform. 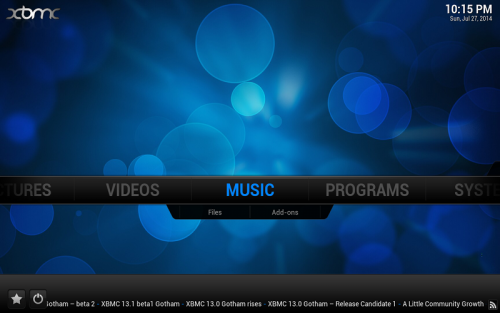 If you are new to Kodi you might wish to check out this section of the wiki: First time user. 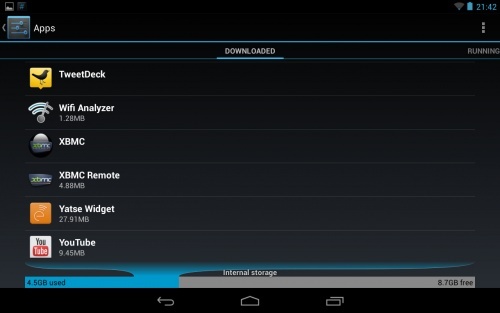 After Kodi has installed you can delete the downloaded Kodi APK file to save some disk space. 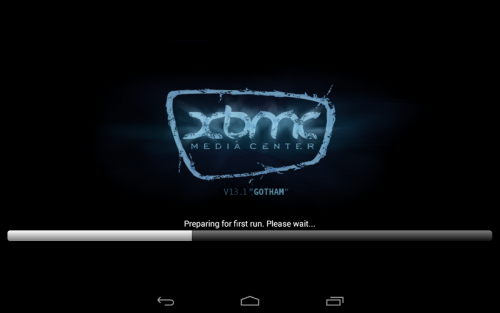 See Migration from XBMC to Kodi for special notes about going from an older XBMC version to Kodi. 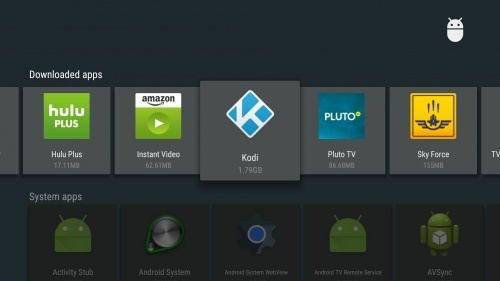 To update Kodi for Android simply follow the normal install steps with the newer version. All your settings and files will be preserved as they are located in a different place in the userdata folder. Be sure to make a backup of the userdata folder when doing updates in case something goes wrong. Note: Since Kodi for Android is signed with our own signatures you will be able to install all succeeding versions without a problem. If you are using a non-official version not signed by us you may be required to un-install Kodi and you will loose all your settings due to this. Be warned before trying. To un-install Kodi just go to your Android settings menu and select "apps". From there you will be able to un-install Kodi like any other Android app. 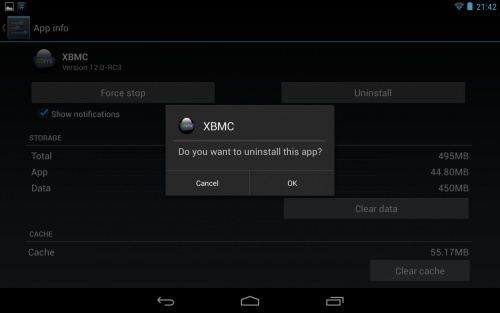 Note: Unlike other OSes, uninstalling Kodi on Android will also erase your userdata folder and all of your settings. 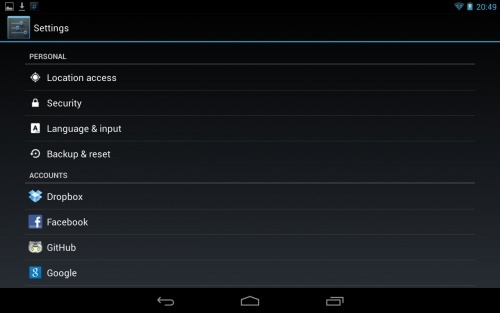 Step 1: Go into your Android "Settings" app and then select "Apps". Step 2: Select Kodi from the list. Step 3: Select uninstall and confirm. 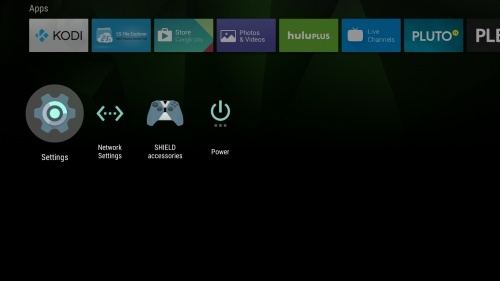 Step 1: Go into your Android TV Settings menu and then select Apps. Step 2: Go to the Downloaded apps then select Kodi. This page was last edited on 10 October 2017, at 13:36.